Excellent news! The NZSO Summer Pops tour arrives in Christchurch this week, not only bringing this amazing orchestra to town but also the irresistibly entertaining Modern Māori Quartet. These guys were the hot ticket at the 2015 Christchurch Arts Festival and they’re back again at their crooning best at Horncastle Arena, Friday 3 March at 7pm. Check out their YouTube channel for a taste of what to expect. We have two double passes to give away but entries close 5pm on Wednesday 1 March so you need to be in quick! Fill out the entry form on our competitions page to be in with a chance to win. Today’s musical offering for library members is Te Ku Te Whe by Hirini Melbourne & Richard Nunns. An extraordinary recording, it reached gold status in 2002 and is still popular today. In keeping with Māori spirituality, the music on Te Ku Te Whe takes the listener into an ancient world, structured by mythology, history, and the moods of nature. The sound and images have been chosen to evoke the closeness of Māori music to the land, the sea and the wind. This album (and over 52,000 more) is available online for free from anywhere with your library card number and PIN. For New Zealand Music Month we are featuring a daily dose of free online New Zealand music from Naxos Music Library and the Source. Not only do we have a great selection of recordings of traditional Māori music in our libraries but we produce a guide to the best resources in our collections and online. 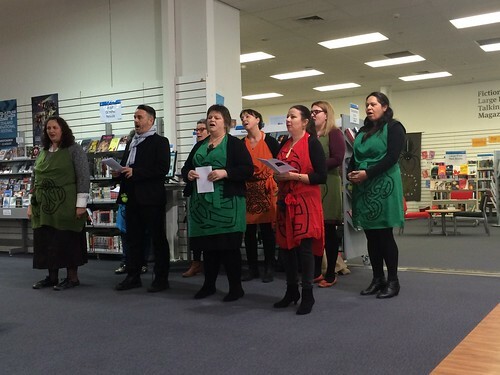 Christchurch City Council has their own waiata group which celebrates at special occasions around our libraries. 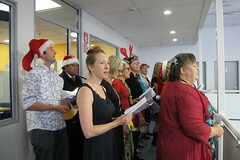 Here they are at Christmas time at Central Tuam Library last year singing carols in Māori. During NZ Music Month you can catch the Shirley Primary School kapa haka group at Shirley Library on Thursday May 16 at 1.30pm. 15,945 albums, over 200,000 tracks, constantly growing – the Contemporary World Music is a fantastic source of musical inspiration from around the world. 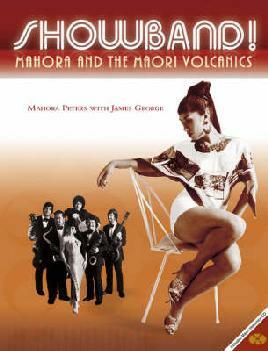 Featured is a selection of Maori music including haka, poetry and traditional songs. I particularly enjoyed the search feature which gives options of instrument category or genre. Each categorey is divided into a huge number of sub-categories which contain something as regular as a drum, or something unexpected like a bowl, to more obscure items such as a mirliton. The home page has a Featured section displays a view of sliding titles giving you the change to stumble upon something new. As well there is an advanced search feature and playlists created by users. This site is a great addition to the library Source collection of databases. Its has an amazing variety of music if you are looking for something with a unique cultural sound. Browse and enjoy! My latest Arts Festival outing was Raising the Titanics. Although my view of proceedings onstage consisted o f the actors’ heads, and only their heads, framed by the backs of the heads of the people sitting in front of me, I still managed to enjoy it. Vanity prevented me from taking a rug (so aging) as recommended by one reviewer and it proved the right call. The dome was toasty warm, and resembled an igloo only in shape. The Titanics, fictionally set in the golden age of the Māori showband, featured some great singing and gave me a craving to hear those beautiful close harmonies from the real thing. Where better to start than The Maori Volcanics? Billy T. James and Prince Tui Teka were alumni, and while I’m listening I’m going to flick through the book about them to enjoy their visual stylings . Recently the Robert McDougall Art Gallery hosted a show by Brian Flintoff and Richard Nunns. These two men – introduced by none other than the esteemed Sir Tipene O’Regan – have spent the better part of their careers learning about traditional Māori musical instruments and the musical expression of pre-colonial Aotearoa. We were treated to a retelling of the creation story complete with sound effects incorporated into beautiful and haunting songs sung by Ariana Tikao. Brian tells a good story. It starts with the separating of Sky Father Rangi – for whom tunes are named after – and Earth Mother Papatuanuku – who provides the heartbeat and rhythm. This is the work of their eldest son Tane, who then filled the new space with sounds, breath of the birds – haumanu, and things from which to make these sounds. This connection with the ‘cosmogony‘ (cor, what a word!) is why they are called singing treasures. Richard and Brian have been hanging out for years and their hilarious banter gave some extra personal flavour to the storytelling. The instruments themselves were amazing to hear and see. Carved and decorated whales teeth and bones, shells, hardwoods, soft stones, gourds, pounamu and even kelp are then blown, struck or swung to create sounds that mimic those made by nature. My favourite instrument is the ‘hue puruhau’. It is a gourd that when swung in a big circle, emulates the low boom of the male kakapo. Way cool! And how about this for a true story… a flute with one hole, the pumotomoto, is played over the fontanelle of a new-born baby’s head to implant songs and information on tribal heritage directly into the child’s subconscious. Now that’s an idea. The echo of the marbled art gallery chamber made the sounds and songs come alive. Another thing that really struck me was how eerie some of this was. If I was about to go for a walk in the woods at night, I’d be scared! See the library website for more on Maori music: contemporary Maori music, waiata, kapa haka and more information on taoka puoro (traditional Maori music). In this Radio NZ programme Richard Nunns plays the instruments and talks about them too.